How is the energy efficiency of windows and doors determined? Insulating glass sealed units (IGUs) are made up of at least two sheets of glass which are separated along their perimeter by a spacer bar to hold them a specific distance apart to improve energy efficiency. As a general rule the wider the gap between the two sheets of glass the more efficient the sealed unit is (though very wide sealed units allow convection of the air inside it and thus becomes less efficient). It is widely accepted that a 28 mm sealed unit is the optimum thickness for IGUs, i.e. two 4 mm sheets of glass either side of a 20 mm space bar. By trapping air between two sheets of glass which are sealed around the edges, insulating glass sealed units are much more efficient at retaining heat inside your home than a single sheet of glass – in much the same way as a Thermos™ flask works. The fact that two sheets of glass are used gave rise to the phrase double glazing, the term which became used to refer to replacement windows generally. In Scandanavia, to improve the energy efficiency of windows three sheets of glass are commonly used in insulating glass sealed units, hence the term – triple glazing. In a standard insulating glass sealed unit which comprises two sheets of ordinary glass, heat from a warm room in your home will be absorbed by the inner sheet of glass and radiated, or emitted, to the outer (colder) sheet, from which it is lost to the atmosphere. Unless this cycle is stopped, heat from inside the house will continue to be lost to the outside world through the two sheets of inefficient glass. A sealed unit with low e glass, such as Pilkington K™ Glass or Planitherm™ has a low-emissivity coating (a virtually invisible metal or metal oxide layer) bonded to the surface of the glass facing the inside of the sealed unit. This low-emissivity coating suppresses the radiation of heat from the warm inner pane of glass to the cold outer one, allowing some of the otherwise lost heat to be reflected back into the house. In this way a sealed unit fitted with low e glass is much more efficient at retaining heat in your home than one without. In addition, light and heat from the sun travels through the outer, ordinary sheet of glass and hits the low e coating on the inner sheet, though some is lost back to the outer sheet, some of the energy is absorbed by the coating and radiated into the house. This bonus heat from the sun, known as solar heat gain, helps to make low emissity glass even more efficient at keeping your house warm. As to be expected, there are different types of low e glass, referred to as having either a hard coating or a soft coating and some more efficient than others. Just a Quote can advise you which one is right for your home. In ordinary sealed units the gap between the two sheets of glass is filled with air from within the factory where it was manufactured. The two sheets of glass are separated by spacer bars and these are rectangular tubes, normally of aluminium which contain a desiccant material. The sole function of the desiccant is to absorb the water vapour in that ‘factory’ air so that you don’t get condensation inside the sealed unit once it has been sealed and subsequently installed. (You often find a white bag of desiccant inside new handbags and brief cases when purchased – its job is the same – to absorb any water vapour and keep the inside dry). 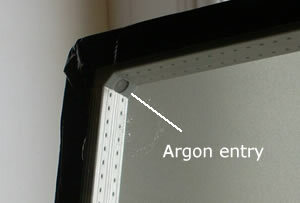 One additional benefit of argon-filled sealed units over air-filled sealed units is that the denser gas keeps the inner sheet of glass warmer than it would otherwise be and therefor improves a window’s energy efficiency. This in turn helps to reduce condensation on the inner pane of glass because more condensation will form on cold glass than on warm glass. 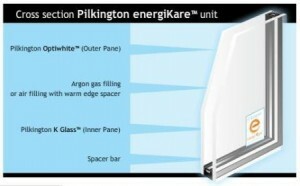 Yes, the external sheet of glass within an insulating glass sealed unit is obviously the first one to allow the sun’s light and heat through it and ‘extra clear’ glass such as Pilkington’s Optiwhite™ glass allows more sunlight and solar heat through it than ordinary glass can. 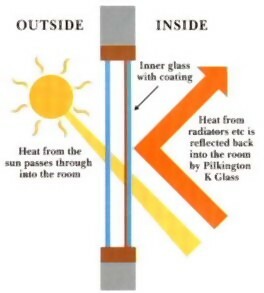 This means that the extra heat and light energy allowed through the Optiwhite™ glass is reflected into your home by the internal sheet of Pilkington K Glass™, thus maximising the sun’s effect of keeping your home warm and reducing heating bills by improving energy efficiency. Surprisingly, it is possible to manufacture a window which is more than 100% efficient at retaining heat in your home. That occurs when the combined effect of any heat loss through air leakage, radiation and conduction is outweighed by the heat gain due to glass such as Pilkington’s Optiwhite™. Yes, traditional aluminium spacer bars between the two sheets of glass result in the edge of windows being the least energy efficient areas of a window because aluminium is an excellent conductor of heat. Improved spacer bars have been made from other metals with a thermal break as well as from thermoplastic, vinyl, fibreglass and foam – all of which improve the energy efficiency of a sealed unit by reducing conduction of heat at the edge of the sealed unit. So-called super spacers have been developed using closed polymer foam which are several hundred times more efficient than aluminium, whilst also reducing noise and the potential for condensation at the window’s edge. PVCu windows are manufactured from profiles of extruded PVCu and the main sections of frame are generally multi-chambered. Having more chambers rather than less can reduce the conduction of heat through the frame by providing extra insulation – rather like a Thermos™ flask. Most PVCu profiles have three chambers, (reinforcement fits in the large centre one and the outer one is for drainage) but some have as many as seven chambers. 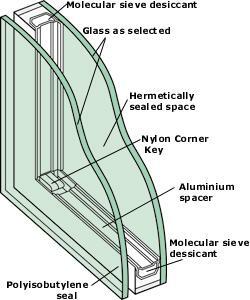 In early PVCu window and door frames there was often only one rubber seal between the vent or sash (the part that opens) and the main outer frame. In time the rubber perishes and shrinks causing drafts between the sections of frame. 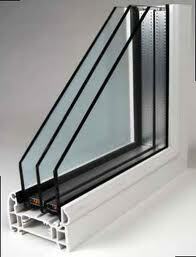 In more advanced PVCu windows there are complex shaped seals abutting the inside and outside of the opening vents and these are now mostly manufactured from EPDM (ethylene propylene diene monomer) a synthetic rubber, or from neoprene (a synthetic polymer resembling rubber) which is resistant to oil, heat and weathering. These improved seals are not only longer lasting but vastly improve the energy efficiency of a window by reducing draughts. Widely used in Canada and Scandanavia, triple glazing achieves levels of insulation impossible in double glazed windows and though they are offered by some replacement window companies in the UK, the additional benefits are generally far outweighed by the extra cost, at least for now. Another consideration is the effect of the extra weight of the third sheet of glass on the size of the opening vents. This can require additional reinforcement inside the PVCu frame and / or the restriction of the size of opening vents due to the extra weight on the hinges. Reducing the size of opening vents however will obviously impact on the effectiveness of fire escapes. Consumers ought to be aware that the ‘A’ rating of a window or door refers only to energy efficiency and there are many other factors which should be taken into account to determine the overall quality and suitability to individual situations. Some companies advertising ‘A’ rated windows are playing on the fact that if a window is ‘A’ rated for energy efficiency, it must be better, in every respect, than other windows that are not. An ‘A’ rated window is certainly better than a ‘B’ or ‘C’ rated window in terms of energy efficiency, but just being ‘A’ rated doesn’t mean it’s the best type of window available. There are many other factors to take into account than energy efficiency when deciding which type of window to install. Sculptured profiles generally look better than plain or chamfered ones, the quality and performance of locking systems differs enormously and the quality of the installation and customer service are also important. All of these factors will affect the cost of replacement windows, as will the installation company’s marketing and selling costs, other overheads and built-in profit margin.